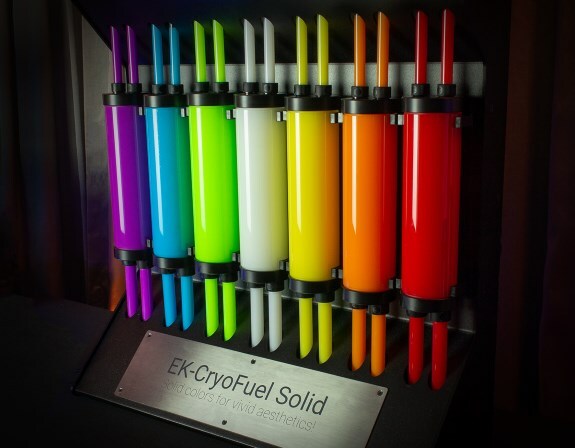 Next week, EK will start taking pre-orders for its new EK-CryoFuel Solid coolants. Offered in seven different colors, these non-transparent, non-toxic coolants will be offered in concentrated 250ml packages for 12.90EUR, and pre-mixed 1l canisters for 15.90EUR. Do note that these fluids are not compatible with aluminium-based liquid cooling loops, like the EK Fluid Gaming lineup. EK® Water Blocks, premium computer liquid cooling gear manufacturer, is proud to announce the launch of a brand new line of EK-CryoFuel coolants! EK-CryoFuel Solid non-transparent coolants are all based on a new patent-pending formula with vivid, long-lasting color stability. The coolant contains everything a high-end liquid cooling system requires for efficient thermal performance and providing the necessary protection for your water blocks. It carries the essential synergistic corrosion inhibitors and biological inhibitors – thus promoting long and safe operational life for your liquid cooling products and high thermal efficiency. Its Solid, it will not break down! The main issue with non-transparent coolants is color pigment particle separation and sedimenting. Our mission was to deliver the most chemically stable non-transparent coolant that would provide enthusiasts and PC gamers with the best possible level of performance and thermal efficiency with the emphasis on color stability. With that in mind, EK-CryoFuel Solid was engineered specifically for the computer liquid cooling systems. EK-CryoFuel Solid is a pure, non-toxic coolant, based on the patent-pending chemical formula, which prevents the creation of any sediments in the liquid cooling loop. Liquid cooling users can rest assured that the Solid non-transparent coolant has very a low viscosity, it will not clog or damage their water blocks and other parts of the loop. EK-CryoFuel Solid also contains synergistic corrosion inhibitors to protect metals commonly found in computer liquid cooling systems. It has been tested in accordance with BS5117 (ASTM D1384) and found to meet corrosion standards for copper, brass, and stainless steel. This coolant also contains biocides to help prevent unwanted biological growth inside your cooling loop. All EK-CryoFuel Solid mixtures are biodegradable (90% in a period of 10 days) and will not remain in the environment or cause any bioaccumulation. EK-CryoFuel Solid offers a 1-year shelf life from date of bottling, the production date can be seen on the packing bottle of the coolant. The EK-CryoFuel Solid coolants are not compatible with aluminum-based liquid cooling loops and EK advises that they are not used with any of the EK Fluid Gaming lineup of products. EK-CryoFuel Solid coolants are made in Slovenia, Europe, and are available for pre-order through EK Webshop and Partner Reseller Network. All pre-orders will start shipping on Monday, the 15th of October, 2018!